(CBS/AP) A strong earthquake rattled northeast Nevada early Thursday, causing at least one building to collapse and forcing the evacuation of a truck stop, authorities said. The quake had a preliminary magnitude of 6.3 and was reported at 6:16 a.m., according to the U.S. Geological Survey. It was centered in a sparsely populated area 11 miles southeast of Wells near the Nevada-Utah line. Residents in Wells report a large ammount of shaking and some trailer homes were shifted due to the quake, reports CBS News affiliate KTVN-TV in Reno. Elko County Undersheriff Rocky Gonzalez said damage was widespread, with people reporting cracked walls and foundations. At least one building collapsed, he said, though it wasn't known what type of building. There were no immediate reports of serious injuries, he said. The Flying J Truck Stop was evacuated because of a propane leak, Gonzalez said. A manager at the business said the store was a wreck, with groceries and goods scattered. One woman was reportedly injured when cigarette rack fell on her. A man who answered the phone at Wells Elementary School said there were cracks in walls and items were displaced. "It was pretty bad," said Jane Kelso, who answered the phone at the Motel 6. "Everything in our whole building shook. "We have cracks in our walls." 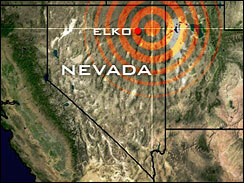 The temblor was felt across eastern Nevada, Utah and as far away as Southern California and Boise, Idaho. In Twin Falls, Idaho, residents reported severe shaking and items falling off shelves. Wells is about 350 miles east of Reno on Interstate 80. So, I guess since no one posted this as it happened, everyone is okay? They should be thankful that this didn't happen closer to Las Vegas. Dayam! With all the recent quakes in Mexico, and now this, I better plan on learning to swim! <------ got scuba equipment ready! Yep. In fact, I was thrown out of bed! About 30 minutes after that, the earthquake hit. Yep. In fact, I jumped out of bed in panic when the earthquake hit. Last edited by McHawkson; 02-21-08 at 11:17 AM. My office building is a 100+ year old converted warehouse. You'd better believe I was in a panic. I find it hard to believe that people in SoCal felt it. Well, we are a sensitive group down here. If only it happened to you and your family's house. How close is this to that place they were going to bury all the waste? I know, I was born and raised in San Diego and just moved to NorCal last year. How do I get it back? Do I attend a class? Are online classes available? Since I've been to Vegas about 5 times in the last 2 years, I've been wondering how well Las Vegas and the surrounding areas would be able to handle a earthquake in the mid 6's. I know most of the casinos have been built in the last 20 years, but there are a lot of the older buildings outside of the strip that probably would have a hard time standing thru a large earthquake. Plus, if you guys lose electricity for many days, especially during the summer, it will be pure hell out there. Don't you see?! The waste caused this! No giant ants/grasshoppers/spiders means no waste is there yet. Crap, I just lost my tinfoil hat card to nemein.